Revolution Porsche have full body shop facilities at our Birstall workshop, and our experienced technicians can handle anything from cosmetic repairs to full restorations, returning your Porsche’s bodywork to showroom condition and providing any required insurance documentation. 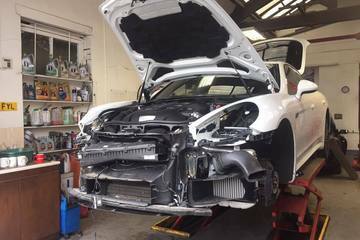 The fully-trained Revolution Porsche body shop team can give your Porsche a new lease of life or a new look with a full respray. 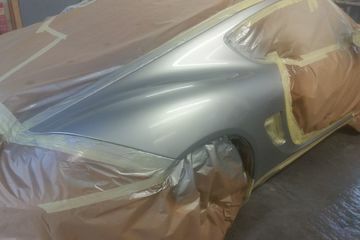 Whether your car needs a respray in its original colour (even from the bare metal) or you just want a cosmetic change, we can help. 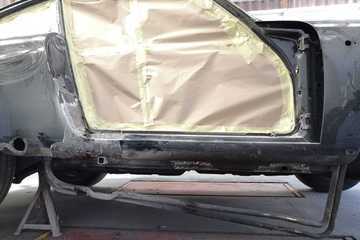 An accident, even a slow-speed one, can result in what appears to be significant damage to your Porsche’s bodywork. Fortunately, it is usually possible to repair dented panels to a high standard and we can leave your Porsche without any signs it was ever in a crash. If stone chips, bird droppings, vandal damage, cats or scratches have left your Porsche’s exterior looking a little tired, Revolution Porsche’s body shop team can help to restore its style. A front end respray could give your pride and joy a showroom standard finish, however old it is. Damage to the wheel arches and sills is a common problem on the 9*6 and 9*7 ranges, but can be effectively repaired before it results in any major corrosion issues. Revolution Porsche’s body shop technicians can remove any trace of the damage and restore the paintwork with a seamlessly matched finish. Our body shop team are experts in repairing scratches, scrapes and scuffs, and can return your Porsche’s bodywork to its former glory without it costing you a fortune. We use the Porsche standard paint colour charts for both recent and older models, so you can be certain of a seamless match. The bumpers are the most likely part of your Porsche to suffer damage, through low-speed collisions and car park incidents. The resulting scuffs and scratches are unsightly and can ruin the overall look of your car. 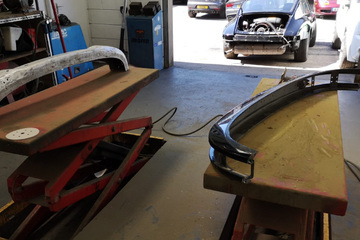 The Revolution Porsche body shop team can help, with our affordable bumper respray service. 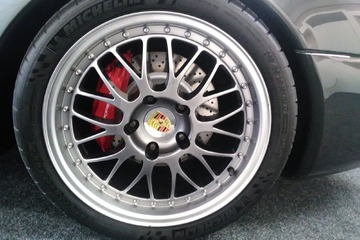 Even a relatively small scratch or scuff on an alloy wheel is very noticeable and, in the mind of the Porsche enthusiast, can ruin the look of the car. Fortunately damage caused by scrapes on kerbs and speed bumps can be repaired, and we have the in-house expertise and equipment needed to make your alloys look as good as new.